Passion is the fuel of the soul; it drives you to attempt and achieve the impossible. When the odds seem to be stacked against you, it is ambition and emotion that regroups, refocuses and reenergizes you. Passion is creating, it is commitment, and it is contagious. Bret Michaels has been successful in this entertainment industry for over 25 years, not only because of his talent, but because of his fervidness. He’s topped the charts from Billboard to Nielsen. From being the front man for legendary rock band Poison to building a one-man $100 million empire with Michaels Entertainment Group, he’s shown us that dreams can come true if you set your mind to them. Not to mention the fact that he’s opened up his world to us, as the media and television shows captured his quest for love and being a devoted father. From philanthropies (Life Rocks Foundation) to fragrances (Thorns & Roses) and beyond, Bret Michaels has poured his heart, his life, and yes, his passion into every project. With him touring on a consistent basis, an upcoming performance at the M3 Rock Festival, a new TV show (Rock My RV) set to debut in a few weeks, a new album (“Good Songs & Great Friends”) slated for release this summer, and a plethora of other involvements, GALO was fortunate enough to have Michaels take time out to discuss some of what is going on in his current career and what has been keeping him even busier and more appreciative these days. GALO: You have another steady string of tour dates coming up and always seem to have a mountain of projects on your plate. So first and foremost, how are you feeling and how has your health been? 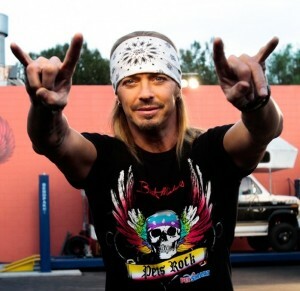 Bret Michaels: I’m happy to say my health is great. I feel better than ever. Always working out, I always stay active. Being diabetic has kept me health conscious since I was six-years-old. In a lot of ways, my diabetes is probably what saved my life — had I not been so in tune with my body, the brain hemorrhage and the stroke may have killed me. But I’m feeling great and ready to rock. GALO: “Every Rose Has Its Thorn” turns 25 this year; a classic, monster rock ballad. Did you expect it to have such a lasting and impactful message that would resonate worldwide? You are also releasing a Thorns & Roses cologne this Spring/Summer. What was the influence for the fragrance and what type of scent can we expect? BM: Did I expect it to? No, you never expect it to, but you certainly hope it does. The point of writing a song like “Every Rose” is to heal; is to reach out and see if anyone has ever felt the way you do, to feel less alone in a painful time. But love and heartbreak are the universal constant [that] transcends race, religion and politics, so I certainly see how it struck the nerve it did, and I’m grateful. As far as the cologne, the influence was to create something that balances perfect for men and women. Not too musky, not too flowery; you’ll have to see for yourself. All I can say is we’ve done lots of tests and it seems like it’s gonna be a smash hit. GALO: Bret, you have starred in and hosted multiple television shows. When you look back on the episodes that have aired, what has it taught you about yourself? Has seeing yourself on reality TV programs made you change anything about your own actions, reactions and interactions with people? BM: I have had a lot of fun doing the reality TV shows. From Rock of Love to Apprentice, I have always stayed true to myself. I took reality TV to mean to be real. So, there’s not much I would change as I look back. I’m certainly not the same person now that I was on Rock of Love, but that is exactly who I was then. But I am happy that I have been able to do a lot of different kinds of shows, from Nashville Star to my new show Rock My RV, which has let me show the world all the different sides of me. I’d hate to be seen as one-dimensional and I believe that reality TV has shown the world that I can party harder than anyone; that I’m a great and loving father; that I’m an extremely hard worker; and now you will see my creative mind working outside of just making music, with the new show Rock My RV when it airs in May on the Travel Channel. BM: Well, the first thing I think that will make the show stand out is that the people that own these RVs aren’t just pimping out vehicles. These people live in these machines, they camp in them, and they all have stories. There’s attachment to them — they don’t just drive to work and back, they make memories with their families; some of them were passed on through generations and the families need them restored. We take it to a level that you couldn’t do by yourself. It’s really unbelievable how these RVs are turning out. As far as my own bus, every year I build out a brand new [one], so this is something I’ve always done. I custom build my bus with a gym and a recording studio, and whatever I need that year. It’s actually a natural progression to do this show, because it’s always been a part of something I do.